The beer Girardin Gueuze is brewed by Brouwerij Girardin in Sint-Ulriks-Kapelle in Belgium. 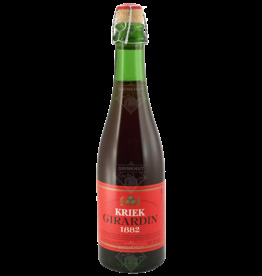 Girardin Kriek is cloudy with a nice creamy taste and a light pink head. The scent is reminiscent of sweet cherries with light tones of sour lambic. The taste is sublime with a nice prickly aftertaste. The beer Girardin Gueuze 1882 is brewed by Brouwerij Girardin in Sint-Ulriks-Kapelle in Belgium.